The 7D is one of the most exciting models in Canons line-up. It is a feature-packed camera, and in many ways it offers the most value for money of any of Canon’s camera bodies. This becomes apparent when you take a look at the cameras specifications. Even though it was launched late in 2009, it remains at the time of writing the only APS-C camera body to be equipped with two processors, and at 18mp it has the highest resolution in its class. The 7D has an advanced autofocus system, with 19 cross-type points, and a sophisticated set of AF functions to make the most of them. The camera has a large viewfinder, with a new glass pentaprism that gives 100% coverage at a magnification of 1x. The new viewfinder features a superimposed display that not only controls the new autofocus system, but also allows the user to make use of a grid to aid composition, as well as a dual-axis level display, to help make sure your camera is straight. The rear LCD screen has a resolution of 920 000 pixels, and adjusts its brightness according to the ambient lighting conditions. It also has a non-smear finish and offers better viewing angles than any of Canon’s older LCD screens. The 7D shares the same LCD screen as the top of the range 1Dmk4. The camera can be operated via a Live View mode, and can also record high-definition video. There is a new shutter mechanism that is rated for 150 000 cycles, the same as the 5Dmk2, and up from the 100 000 cycles that the 60D is rated for. The camera has seals and O-rings wherever moisture might enter the body, and is weather resistant when used with a suitably sealed Canon EF-L lens. The body is constructed from magnesium alloy and the 7D is built to be substantially more durable than the 50D/60D line in every way. My initial feeling when I first picked up the 7D was that Canon had taken a very close look at Nikons highly successful D300 camera, and designed the 7D to meet or beat the D300 in every way. Whether they succeeded in that goal perhaps only time and sales figures will tell. For Canon enthusiasts, the camera makes a natural upgrade for photographers who were enthusiastic fans of the 20D, 30D, 40D and 50D series. Given the high specifications of the 7D, and how similar they are on paper to Canons top sport camera, the EOS1DMk4, one could be excused for wondering how it is that the Mk4 sells for more than the cost of two 7D bodies! The 7D body feels just right, with a new bulged shape to the rear of the grip. It is similar in size to Canon’s full-frame camera, the 5Dmk2, and actually weighs a little more than the mk2, coming in at 820g without a battery. One of the first things to notice on the back of the camera is the eyepiece which is identical to those found on the 1D series. The new –age viewfinder is a big improvement on anything Canon has done before this. The symbols and digits inside are bright and easy to read. Information on display within the viewfinder includes the number of shots left in a burst, battery level, white balance custom setting, flash compensation information as well as the usual exposure scale. With the 7D it is possible to set exposure compensation a full 3 stops on either side of 0, which is 1 stop more than could be done with either the 5Dmk2 or the 50D. That is quite a useful feature, and saves me having to go to Manual mode when working on extreme ends of exposure settings. The viewfinder has a grid which can be switched on, that instantly helped me get my horizons straight whilst shooting. I am hoping that this type of viewfinder makes it into more of Canons cameras. With 100% coverage, you get pretty much what you see from this viewfinder. There is a mode dial on the left side of the camera, with a new-for-Canon on/off switch at its base. The mode dial has the following settings: Automatic; Creative Auto; Program; Time Value (Shutter); Aperture Value; Manual and Bulb as well as three user defined Custom 1, 2 and 3 settings. The mode dial is very easy to bump, and when you carry your camera in a soft-sided bag like I do then it is very easy to accidently switch the mode dial upon lifting the camera out of the bag. I found this really irritating, as I often have to get my camera out quickly, and with many shy subjects, the first few seconds are often critical. I have missed several opportunities by bumping the dial to Manual or some other setting in this way. 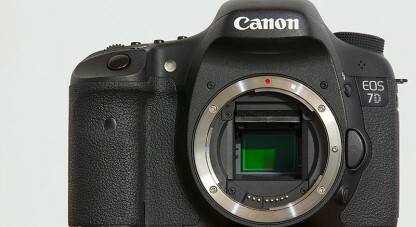 Good news is that Canon has made it possible to have the 7D fitted with a new locking mode dial as an after-sales option. I am hoping that Canon move forward with fitting the locking mode dial throughout the range, as seen standard on the 60D. On the back of the camera there is a Q button (it stands for Quick Control) that brings up a screen with the camera’s shooting settings displayed. You can choose to make changes by using the control dials and buttons, and see the new settings displayed on this screen, or you can make the changes by using the rear screen as an interactive menu and scrolling around in it by means of the quick control dial, the main dial and the multi-controller. The 7D has a button on the back of the body called Raw/Jpg, and pressing this button will cause the camera to take a raw shot plus a large jpeg shot the next time you press the shutter button. This takes place even if you have the camera set to only take raw images, or to only take jpeg images. The change only takes place for one image, and then the camera reverts to its original state. This is a useful function. The LCD screen on the 7D has a resolution of around 920 000 dots and a wide viewing angle of 160 degrees. Canon has filled the space between the protective cover and the liquid crystal panel itself with an optical resin material that reduces light reflections inside the monitor. The protective cover is no longer made from an acrylic substance but instead is manufactured from reinforced glass. This protective cover is more resistant to scratches and smears. In use the LCD screen on the 7D does everything it is supposed to. However, be aware that the thumbnail that appears on the screen is processed via the default Picture Style settings and will have received a healthy dose of colour, contrast and sharpening during the resize process. This can be a little misleading for users new to the camera as it is quite likely that the corresponding raw image, when viewed on a big screen may appear a little flat in comparison. The Picture Style processing enhancements are only applied to the in-camera jpg image if you are shooting in RAW and those settings do not have any impact on raw images processed with software other than that supplied by Canon. Some users go into the Picture Style menu and reduce contrast and saturation a little in order to have the image in the LCD display match the raw image more closely. The histogram provides the most accurate information and it is a good idea to shoot with the histogram display switched on. The camera also has a built-in electronic level. The level can take the form of a graphic display on the LCD screen, or make use of the AF points to light up in the viewfinder when the camera is level. The brightness of the screen can be set. The high-quality LCD screen fitted to the 7D makes using the camera an easier and more pleasant experience than any of the older Canon dslrs. The 7D is a quick, light-feeling and quiet-sounding camera that is responsive and fun to operate. That responsiveness can be quantified by examining some numbers relating to speed. The camera has a shutter lag period of 0.59ms. Compare that to the 5Dmk2 at 0.73ms, and the 1Dmk4, at 0.40-0.55ms. Viewfinder blackout, which is what happens when the mirror swings up out of the way in between each shot being taken, is just 100ms. Compare that again to the 5Dmk2 at 145ms, and the 1Dmk4 at 80ms. What that means is that when you need to shoot fast, the 7D can handle it. In this respect it is closer to the 1Dmk4 than it is to the 5Dmk2. The twin Digic 4 processors (apparently identical to the 1Dmk4) handle the 18mp files that the 7D churns out at 8 frames per second quite rapidly. The buffer is rated at 15 images, which is a good number, and in use I never once managed to fill the buffer. The 7D does need fast CF cards though, and it can take advantage of UDMA-rated memory cards. One should really be looking to use cards that are UDMA rated and can write at 60Mb/sec to take full advantage of the Digic 4 processors. Anything much slower than that and your buffers ability to clear quickly in continuous shooting may be affected. With a fast card in the slot, the camera easily exceeds the 15 frame buffer limit quoted in the user’s guide. A single image file from the 7D will be anything between 20 and 25mb in size, so large capacity, fast CF cards are a must if you want to take full advantage of this cameras speed potential. The maximum frame rate of 8 frames per second with fully functional AF is class-leading, and just about fast enough for any type of photography. 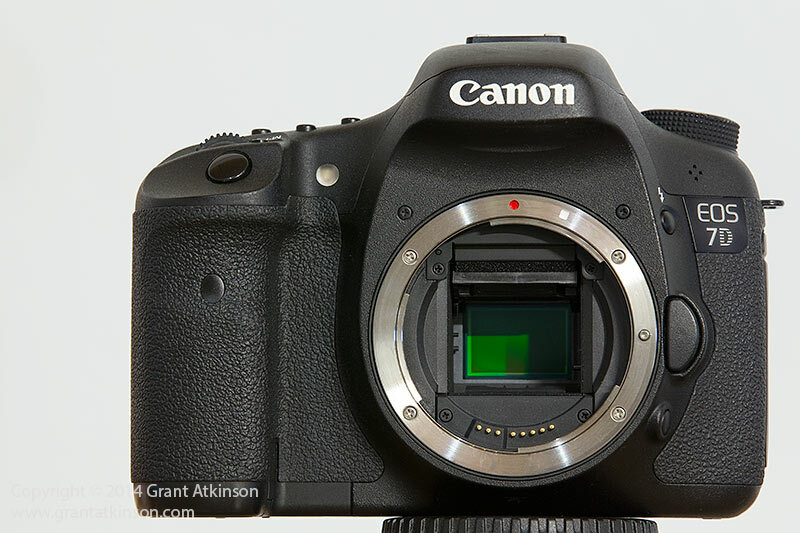 Canon have fitted the shutter switch from the 1D series to the 7D. 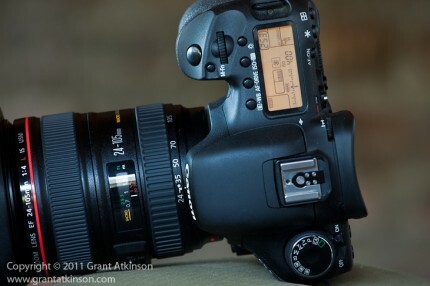 On the 40D and 50D, the shutter switch has proven to be a weak point, as they are prone to failure after heavy use. I am not writing here of the shutter mechanism, but rather the switch that is activated by the shutter release itself. After many actuations, a good number of 40 and 50D bodies end up having shutter release buttons that have to be pressed harder and harder to actuate the shutter. Fortunately, the 7D should be different with the much more durable 1D switch. The shutter mechanism itself is rated for 150 000 cycles, and given how fast this camera is, the extra 50 000 shots over the 50D/60D may come in useful in time. The new position of the On/Off switch under the mode dial takes a little getting used to, especially when you are switching between other Canon bodies which have their On/Off switch to the right side of the rear screen, on the back of the camera body. One advantage of the new switch on the 7D is that it just switches the camera on and off and does nothing else. Other Canon bodies have a third position to the On/Off switch which activates the rear Command Dial as a means of adjusting exposure compensation. It was easy to accidentally dial in exposure compensation without even noticing that you had done it with the old switch, as found on the 5Dmk2 and 1D series. On the 7D, there is a dedicated switch under the Command Dial which activates it for controlling exposure compensation or locks it. This camera has the best implementation of Live View I have used. A dedicated switch engages Live View at the touch of the button which is centred in a swivel switch. For me, Live View is most useful when shooting landscapes or macro images off of a tripod. I can check the exposure histogram, zoom in and check focus, and frame carefully using the framing grid. To switch to Movie-taking mode, simply click the same switch onto the red position, and press the Set button to start filming. It is all easy, intuitive and fun to use. Again, I am hoping that the next generation of Canon’s other bodies come out with similar controls. Battery life is exceptional, and the LP-E6 battery will usually easily provide power for over 1000 raw shots on a single charge. The battery level shows up in the viewfinder, and the menu provides a remaining charge percentage as well as a shot count per battery on the screen readout. It also has a graph showing the batteries condition in terms of its life. I never ran a battery out completely. It takes about 90 minutes to two hours to fully charge a completely flat battery. My cameras do most of their work shooting African wildlife in an environment that can be tough for a camera to survive in. Heat and dust are ever present, especially in the dry season. I try very hard to minimize changing lenses in the field to prevent dust getting into the camera body. To this end I will make use of two or sometimes three bodies when in the field. When it comes to keeping dust off of the sensor, and autofocus screens/mirrors, the 7D is the best camera I have used at the time of writing. The new slippery coating on the sensor really seems to work well in conjunction with the self-cleaning vibration process that takes place at start-up, and I was able to shoot for months at a time without having to clean the sensor or the AF screen. Both the 5DMk2 and 1D bodies collect dust a little easier, probably due to the larger openings for their bigger sensors. Another place where dust can show up is on the autofocus screen. This does not appear on the images but it is seriously irritating and is seen in magnified form each time you look through the viewfinder. It is usually easy enough to gently blow the particles off with careful use of a hand blower. Again the 7D was pretty good at keeping clean in this regard too. It is useful to be able to put copyright information and the camera owners name into the files via the menu function on the camera. This is a step forward from the 1Dmk3 where the camera had to be connected to the computer via the Canon Utilities program in order to insert that information. As I use Adobe Bridge to manage my picture files, I insert my own metadata early in my own workflow process, but it is still nice to have the option. The camera body and its inner covers are made from magnesium alloy, which is light but very strong. 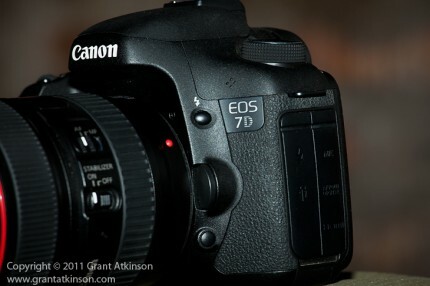 It gives the 7D a chunky, substantial feel. I found the 7D to be pretty tough in use and never had any issues in this regard. My pair of 7Ds performed superbly even when used from an open- windowed Cessna aircraft, taking aerial pictures of the Namibian mountains and dunes. I had to lean slightly out of the open-window in order to not include the aircraft in my frame, and ended up shooting in direct wind speeds of around 170km/h. I held onto the camera so tightly I feared I might dent the grip but of course that never happened. Another extreme situation that my camera found itself in took place on a summer’s day in Botswana’s Central Kalahari Game Reserve. The air temperature was in excess of 42° C in the shade, and I set a 7D up outside, in full sun ,with only a simple green cloth wrapped around the body for protection. I was using the camera to photograph remotely at a waterhole. On the same day, a professional grade camera body (not a Canon) stopped working due to the heat, and that was in the shade inside the vehicle that we were watching the waterhole from. In some ways the 7D is one of the easiest of Canon cameras to set up, and it offers a more simplified approach to setup than the 1D series. However, if you are moving from an entry-level camera, or even the 40/50/60D series, then you may find that the 7D has a lot more to set up than the simpler cameras. In particular, the autofocus needs careful setup to get the most out of it for different situations. It is also possible to set up the camera buttons and controls to suit your own shooting style. There is a dedicated menu screen to help make this easy. It is located under the Custom Functions menu, and named Custom Function IV: Operation/Others – 1: Custom Controls. Here you will find a drawing of the camera that serves to illustrate the possible menu options as you scroll down the menu. This screen enables you to enable, change and switch the controls to your heart’s desire. The 7D is the most configurable of all of Canons cameras at the time of writing, and again, and I am hoping that the next generation of Canon cameras follow this lead. 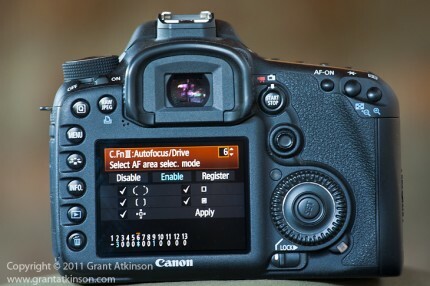 For my own 7D, I used this screen to allow direct selection of my AF points via the multi-controller, and I set up the * button which usually locks exposure, to rather stop autofocus. That way I can stay in Ai Servo whilst shooting, and still lock the focus temporarily when I need to recompose outside of an AF point. That is just one example of what you can do, there is much more. Spending a little time setting the camera up carefully for your use will pay dividends later. With the camera on, you can press the INFO button to display the camera settings on the LCD monitor. Pressing it again displays the electronic level. Pressing it once more displays the shooting settings screen, which can also be accessed by just pressing the Q-button. The menus on the 7D run deep, and there are a lot of options for setting up the camera to suit different user styles. These include creating your own menus, with your most frequently used menu options prioritized. It is also possible to save groups of settings that you use often as named presets, for easy and quick recall whilst shooting. For the purposes of field testing and for all my wildlife photography, I shoot the camera set to the RAW quality only. 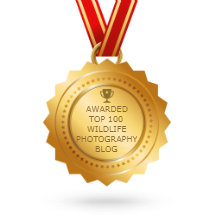 As a wildlife photographer, I am looking for great image quality, high-performance autofocus, and ease of use in a camera. The 7D met these requirements with some qualifications. I made extensive use of the following Canon lenses on the 7D: EFS 10-22, EF 16-35 L f/2.8 II, EF 70-200L f/2.8 IS version I and II, EF 300L f/2.8 IS. I always shoot in RAW and process my images using Adobe Camera Raw and Photoshop CS5. If you shoot only jpeg images with the camera then some of what I have written here pertaining to image quality will not be that relevant. I turn off Long Exposure Noise Reduction (Custom Function II: 1 set to 0), disable the in-camera High ISO speed noise reduction (C.FnII:2 set to 3). I also disable the Auto lighting optimizer and Highlight tone priority (C.FnII:3 set to 0). My reasoning is that since I am shooting in RAW most of the time, I prefer to do those processing steps myself afterwards, with more care and my own personal judgement, rather than have the camera applying the actions globally. Even if I am shooting in RAW only, by turning off those actions it means they are no longer applied in-camera to the jpeg thumbnail that the camera creates for the rear LCD display, thus freeing up the processors from carrying out unnecessary work. The 7D has an 18mp sensor, and this is a big plus for the camera. This 18mp sensor is of a similar physical size to the sensors found in the Rebel/550D/600D and Canon’s 40D/50D/60D range and is known as APS-C . This particular version has physical dimensions of 22.3 x 14.9mm. To give an idea of the just how big a 7D image is, a vertical crop taken from a horizontal shot will leave you with a vertical image of 2304×3456, which equates to exactly 8.0 megapixels. Not only can you crop out a high-resolution vertical shot from an original horizontal image, but you can also easily crop to bring distant subjects closer. Many of my best bird images are taken with this camera, mainly for this reason. Having megapixels to spare also allows you to straighten horizons and crop the image into shape without worrying about losing too much resolution. And of course, an 18mp file can create a fantastic, large and very detailed print. At the time of writing the 7D remains the highest resolution APS-C sensor camera around. The APS-C sensor is smaller in physical size than the sensor found in the 1Dmk4 () and still smaller than that found in the full frame 5Dmk2. What this means is that the APS-C sensor size gives an effective lens magnification effect of 1.6x the focal length of whatever lens is mounted on it. In real-world terms a 300mm lens becomes equivalent to approximately 480mm focal length when mounted on the 7D. 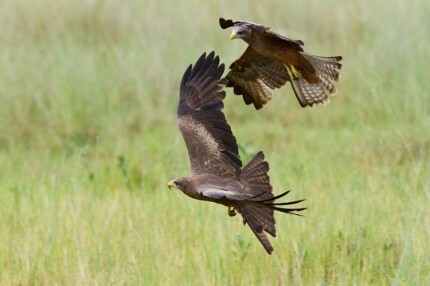 This is a very big benefit for wildlife photography where distance is often crucial. Another benefit of the sensor being substantially smaller than a full frame sensor is that the edges of the image that the lens projects do not fall onto the sensor, and thus are not used. This means that one does not have to deal with vignetting which is normally visible on these corners of the image. Of course for landscape photography, the smaller sensor size means that wide angle lenses become a bit less wide, and this is not always a desirable change. Fortunately for us Canon make a wide range of lenses for the APS-C sensors that cover almost all focal lengths. The 7D accepts Canon EF-S lenses, which are those marked with a white mounting point indicator. I used the excellent EF-S 10-22mm lens on the 7D with great results. With the crop sensor, this lens equates to 16-35mm on a full-frame camera. With this high-resolution sensor and the potential to crop, and its’ 1.6x crop factor, the 7D can bring far-off subjects closer than just about any other APS-C camera body around. When shooting unpredictable action sequences, there are often times when it is best to pull back on focal length, to give a little room for the action. Shooting this way with the 7D worked brilliantly, as having the luxury of being able to crop the generous 18mp files afterwards is great. The resolution is a big plus. Of course, when it comes to sensor optics, you always have to give and take. So while the 7D provides lots of resolution and reach, it does suffer a little when it comes to low-light performance. In bright light the image quality is good, and at very low iso sensitivities the 7D files are clean in terms of noise. The first signs of noise become visible from iso 400, although noise levels are not bothersome at his setting. From iso 800 upwards, noise becomes clearly visible. On such images, and those shot at iso1600 or higher, I carry out careful post-shot processing to remove the noise. The camera can take very usable images at iso1600, and even at iso 3200, but such shots will require some processing to clean up afterwards, depending of course on what you intend to do with them. How one feels about digital noise is subjective though, and what is acceptable to me may not be acceptable to another user and vice versa. For my use the 7D worked very well for me in good light but I found the 5Dmk2 and the 1Dmk4 to be better performers in very low light. Overall, the 7D creates images with a lot of detail in them, although not quite of the same standard as the 5Dmk2 or the 1Dmk4, which is to be expected, as both those cameras have sensors with larger individual pixels and cost a lot more. I have included in quotation marks an excerpt from Canon Professional Network’s European website to help explain further the next part of this review. This is a simple enough statement, coming as it does off CPN’s Europen website, but in real-life conditions it can have some important implications for users of the 7D, and any other Canon dslr bodies equipped with the same sensor. What it means in use is that if you are shooting long lenses on your 7D, you will get more sharp shots by shooting shutter speeds faster than the norm. The old maxim of needing a shutter speed equivalent to the focal length of your lens may no longer apply. With this camera you will do better shooting fast shutter speeds. You can get those speeds by opening up your aperture, or by bumping up the ISO. If you are shooting moving subjects the same applies. I suspect that many early complaints that surfaced about the 7D autofocus not functioning well were in fact rather due to camera or subject movement causing very slight blurring of the image. Of course there will always be exceptions to this, but generally speaking, shoot fast speeds and the results will be sharper. As pixel pitch sizes continue to get smaller, this same approach will need to be taken with all dslr bodies, but at the time of writing, the 7D has the smallest APS-C pixel pitch at 4.3 microns. The 7D has a sophisticated autofocus that can be fine-tuned in a whole number of ways to suit the users preferences or to tailor it to specific shooting conditions. The camera has 19 focus points, arranged in a grid that covers a good portion of the frame, making it easy to choose a focus point exactly where you need it. All 19 points are cross-type sensitive with an f/5.6 or faster lens attached. Compare this to the 60D which has just 9 cross-type points, and the 5Dmk2, which has only one cross-type point in its nine-point selectable array of AF points. Cross-type points offer superior focus performance to horizontal-only or vertical-only type AF points. The centre point in the 7D’s cluster of AF points differs from the other 18 points in that it is f/2.8 sensitive. What this means is that if a lens with an aperture of f/2.8 or larger is mounted on the camera, then the centre point will offer high-precision focus that is approximately twice as sensitive as the other 18 points. This is important to remember if you are able to make use of a fast lens with an aperture of f/2.8. When shooting in difficult conditions for autofocus to function in, the increased performance of the centre AF point can make a big difference. Some examples of such difficult conditions for AF might be subjects that are moving very fast, or backgrounds that are similar to the subject making it hard for the camera to recognize the target, and very low light. The 7D allows the user a lot of control over how the 19 AF points are utilized or grouped. The different options can be activated by going to Custom Functions (the orange camera symbol in the top menu) and cycling through to Custom Function III-6. There are five options but at the camera’s default setting only three are available. To change this select Register from the row of options, then place a check mark next to each of the AF Area modes that you want available. All 19-point AF auto selection – in this mode all the points are used to focus. The camera chooses what it thinks is the subject. This mode tends to focus the closest subject first. Not always the best choice for wildlife subjects unless they are easily differentiated, for example a big, slow flying bird in the clear blue sky. Users have little control over exactly where the AF point is when the shot is taken. Zone AF (Manual selection of zone) – in this mode the AF points are grouped into five different clusters, and marked by thin black lines in the viewfinder. There is a central, upper, right, left and lower cluster. The photographer chooses which cluster of AF points they want to select, with composition in mind. This mode is easy to use and very effective when the subject is large in the frame. Zone AF also works well on subjects that are not moving too rapidly. It is also very easy and fast to move the cluster to any one of the five zones in the AF grid. It may not be the best mode to use when actual pinpoint accuracy with the AF is required, especially on smaller moving subjects, as the photographer does not have total control over which of the AF points within a selected cluster will focus on the subject. The actual AF point in the selected cluster that finds focus will light up in the viewfinder. AF Point Expansion (Manual selection) – In this mode the photographer manually selects any single AF point to focus with, and the adjacent AF points are activated to be able to “assist’ in tracking the subject. If the selected AF point loses focus on the subject, one or more of the adjacent points may then be able to take over focus tracking. This setting is favoured by many action photographers, as it increases the area covered by AF points slightly, but still allows the user control over where the active point is placed. I found it quite effective in challenging AF situations although still a little slower than when I had just a single AF point selected. Single-point AF (Manual selection) – in this mode the photographer selects any single AF point to focus with. The only point that actively seeks to perform AF is the selected point. Whilst this mode lessens the size of the active AF area as only one point is active, it increases the speed at which AF can function, as the camera has less work to do when it comes to processing data from AF points that might not be on the target. I use this mode almost all the time, and find it to be the fastest, most accurate and reliable AF mode. It does require care on the part of the user to ensure that the selected AF point is placed exactly on the subject. Spot AF – (Manual selection) – in this mode the photographer selects any single AF point to focus with. It is similar to Single-point AF however the size of the actual focus point is much smaller than with any other focus area mode, and it is intended for pinpoint focusing rather than for targeting moving subjects. Spot AF works well when taking macro pictures, or when photographing through obstructions. Those are the five AF Area modes described. After lots of experimentation, I settled on Single-point AF for most of my shooting with the 7D. These modes only really control how many and in what association the AF points are put to work. First up, with the camera switched On and in any one of the non-automatic modes, select Ai Servo for your focus mode after pressing the button on the top marked AF. Ai Servo is the moving subject mode, as opposed to One Shot, which is for still subjects. Ignore the Ai Focus setting in between those two. The discussion that follows is based upon the assumption that the camera is in Ai Servo focus mode. This will bring up a menu numbered from 1 to 13 on the bottom of the screen. 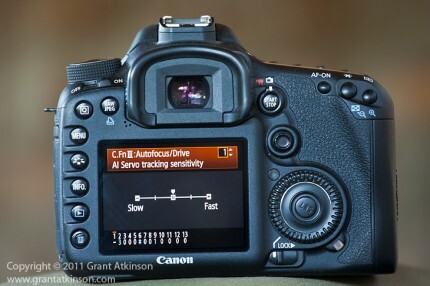 Custom Function III: Autofocus/Drive 1 – Ai Servo tracking sensitivity. This setting controls how long the camera will ‘wait’ when the selected active AF point falls off the target during AF tracking, before trying to refocus. Instead of the AF suddenly jumping to the background, it can be set to wait for a longer or shorter period before it tries to focus again. It can be particularly useful when shooting moving subjects against a busy background to choose one of the settings on the “Slow” side of the scale. In such instances I will set the AF Sensitivity (C.FnIII:2) to either 0 or the setting in-between 0 and Slow. This setting depends on what I am shooting, how fast it is moving and how similar the subject tone and brightness is to the background. The more similar the subject is when compared to the background, the more likely it is that I might lose focus when and if I momentarily move the active AF point off of the subject, so choosing a slower setting gives a little more time for me to ‘re-find” the target before the lens goes completely out of focus and jumps to the background. I have also found that when using very long telephoto lenses with smaller maximum apertures, such as the Canon 800mm f/5.6 lens, that I obtained better results by setting AF Sensitivity to Slow. This made the AF response less jumpy if I inadvertently moved the AF point off the target . This AF sensitivity setting does not affect how quickly initial autofocus is achieved, for the first frame and AF acquisition, whether set on Slow or Fast. With easier AF situations, like birds flying in a blue sky, I would choose 0. Focusing very fast-moving subjects is generally easier with faster lenses, and when using the Canon 300 f/2.8 lens, I most often keep this Custom Function set to 0. With that lens, I just prefer the response of the AF set to the default 0 or even toward the Fast side of the settings. To get the most out of the autofocus system, it will benefit the user to make themselves familiar with these settings by practicing with different settings, and selecting settings to suit specific situations and different lenses. Custom Function III:2. Is another important AF custom setting to take note of. It is Ai Servo 1st/2nd image priority. The camera allows the AF unit a certain, standard amount of time to perform focus calculations. This standard amount of time is usually enough for most focus situations that the camera has to deal with. 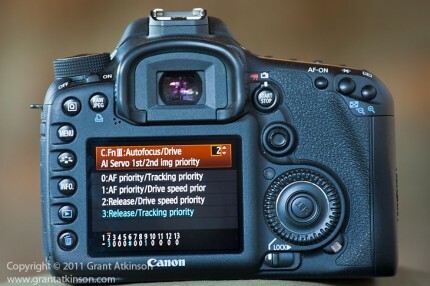 It is called Release or Drive Speed Priority in the camera menu. This custom function allows the user to select an option which extends the time that the camera allows for autofocus to take place, which may result in more accurate focus results. This option is called AF Priority or Tracking Priority. The 7D has four different options when combining how these two different time settings work with one another. Custom Function III: 2: 0: AF Priority/Tracking priority, the camera will allow the extended period of time for the AF to find focus for the first frame in a burst, as well as the frames that follow. This should in theory improve focus especially in tough autofocus situations where the background and the subject are similar in tone and brightness. Be aware though, that this setting can slow down the frame rate, which might mean that you take fewer shots of an action sequence. Also, because of the extra time allowed between shots, it can sometimes cause a very slight pause as the camera tries to focus, and it can almost feel as if the shutter release button isn’t working for a moment. Custom Function III:2: 1: AF Priority/Drive speed Priority, the camera will allow the extra time for the first shot, then for the shots following it will allow only the standard, shortened time period for AF to take place. It will still try to attain focus between each shot, but for only the standard time period. Custom Function III:2: 2: Release/Drive Speed priority. When this option is selected, the camera will take the first shot as quickly as you can press the shutter, and all those that follow in the burst. The camera will allow only the standard shorter time for autofocus to take place between each shot. In this mode the 7D can fire at 8 frames per second. This option will enable rapid bursts and I often use this setting in easier autofocus situations like a large bird in a blue sky or similar. Get familiar with these settings and make use of the setting that works best for you, given different focus situations. Custom Function III:2: 3: Release/Tracking priority. The camera will take the first shot as quickly as you can press the shutter, but will allow the longer period between each frame after that for extra focus time. This allows the user to get the first shot off very quickly, and then allows extra focus time between each frame in the burst after that. In its default mode there are two options for moving the focus point. 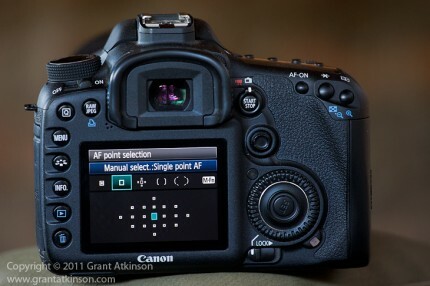 First, press the top right button on the back of the camera, and then use a combination of the main dial and quick-control dial to select the desired AF point. Alternatively, press the top right button and then move the multi-controller, which provides direct access, not sequential, to any AF point in the grid. It is possible to do away with first having to press the button on the top right of the camera body first, by going to the Custom Functions menu, Custom Function IV: Operation/Others: 1 Custom Controls. From that screen select the option that will make AF point selection direct via the multi-controller. Once you have done that, there is no initial button to press, just touch the shutter to activate the camera, and move the multi-controller. I have found this the fastest way to move around the AF grid, and this is something that I do a lot whilst shooting wildlife. I set up all my Canon dslrs in this way. When the subjects are moving, I find it most valuable in a camera to be able to activate the focus point I want to use as rapidly as I can. I shoot almost exclusively with my camera set up in Ai Servo, and most of the time I use a single AF point, manually selected by myself. Custom Function III:3 Ai Servo AF tracking method: This custom function will only affect how AF works if you have AF expansion or AF zone selected. When you are attempting AF tracking with a group of AF points, this C. Fn will affect whether the AF sees new subjects in the frame that are closer than the main subject as new targets to track, or whether it ignores any new subjects as obstacles to AF. If you are using AF expansion, or AF Zone, and you select Option 0 for Main Focus Point priority, if a new subject enters the foreground closer than the main focus point, the AF will switch to the new, closer subject. This has perhaps more application in sports than wildlife. The EOS 7D is a camera that offers excellent value for money. It can be set up to suit different users and shooting styles. Easy and totally absorbing to shoot, the 7D has almost all bases covered. It is virtually a professional –level camera in every respect, except for image quality in low light, which is still good but not quite as good as some other models in Canon’s line-up. Just bought the 7D a week ago. I’m going to bookmark this page. I am looking forward to you letting me know how you get along with it. Definitely one of the more exciting cameras to use! Just got a 7d myself and will be working on the custom settings, your pages has been very useful. Do you have any suggestions for the custom dial (C1-C3) settings for wildlife field work ? Glad the post has been of use, the 7D is a camera with a deep feature set and it is exciting setting it up with all the options available. For the C1-C3 settings, I usually set one of them up for very slow shutter speed, so that I can shoot motion blur. Settings might be something like TV, 1/20sec, iso 200. Also might set one up for any action that might happen fast, say AV, aperture at f/4.0, Iso 800 … ambient light will determine what shutter speed I get. I know Canon 7D has 19 point AF features available in viewfinder. I am looking how to get AF points in LCD screen in live mode shooting (in picture mode, not movie mode). I searched this info in manual and google. Couldn’t find any useful info. I tried Quick mode option, didn’t work. Not sure AF 19 point focusing only available in viewfinder. I would appreciate if you could share some info. Once you switch over to Live View on the 7D and all current Canon DSLR bodies, the mirror is flipped up out of the way,and your “normal” autofocus operation can no longer take place. All focus then takes place by means of contrast detection from data from the actual image sensor itself, and you are provided with a single AF point that you can move around the frame over quite a wide area. You no longer have access to the regular 19 point AF array, as that AF sensor does not receive information once the mirror is up and out of the way. I have had good results using the EF-S 10-22mm paired with the 7D, makes for a lightweight outfit that was ideal for landscapes and I especially enjoyed using it from the air. I found AF to be better than that in the earlier 40D and 50D bodies, but not as good as that in the 1D series of that era. I have not used the EF-S 15-85 but i do get to use the EF-S 17-55 f2.8, and that is a great performer on the 7D. 7D is great camera, but not FF. So now 5D MK II is better for me. Thanks for great review! Hi Cedric, great news about the 7D. Unfortunately I had to re-create my website on a new platform a couple years ago, and I no longer have that 7D autofocus post available. However, if you refer to the two posts on 5Dmk3 and 1DX autofocus, ignoring the AF Cases descriptions (which are not relevant to the 7D), then the explanations for the function of Ai Servo 1st Image Priority and 2nd Image priority are pretty similar, as well as the most important Ai Servo parameter for me, which is Ai Servo Tracking Sensitivity. Also, the discussion in my last post on the 1DX AF relating to the different grouping of AF points, AF Zone, Single Pt AF, Spot AF etc are all similar to what the 7D has, so that information is also pretty relevant. I will also probably try get a new 7D/70D AF guide online in the next few months. Is still worthed today in 2018 this camera? Hi Vedran, I think it depends on what you want to use it for. If you will be working in good light, and not needing to go over iso 400 very often, then it can be a reliable, fast camera with tough body, good buffer capacity and reasonable autofocus. But it will depend on how much you have to pay for it. Newer APS-C sensor cameras like the Canon 70D, and even more so, the Canon 80D, the 77D and even the 750D and 760D, basically the last two years of Rebel models, can outperform it in image quality and just as good if not a little better in autofocus. But none of them are as tough. 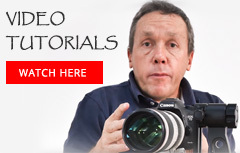 I do have a comparison on the website of the 7D to the 70D.